The Blue Book; The Ultimate Project is the Terrestrial Non Human Project to introduce us to their existence alongside us on this Planet. With unique photographs of interaction between a variety of Craft, also including arrivals and departures. It's time to know! simply said 'Hello'. 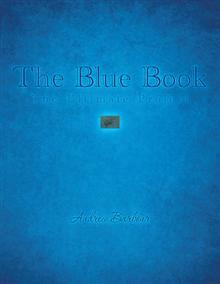 It took 32 years to realise I had been heared that day, a simple act that I found influenced the course of my life, and eventually led to the assembly of The Blue Book; The Ultimate Project. At the age of 15 I encountered religion and decided if there was a God there must be a Devil, so in my naivety words were said that changed everything. Something heared those words and a tall humanoid shape in silhouette appeared next to my bed. What happened next I can only describe as being scanned. A band of energy worked its way from my feet to my head then blackness. This set the stage for the next 25 years, finding my way through forms of Christianity and Satanism. Both unconventionally practiced before finally enbarking on an equally unconventional Shamanic Path as a balancing point between the two extremes of Faith. By the end of this period I knew we were not the only beings on this Planet. But it still felt like I was waiting for something that was yet to come. central line near the wider end of the object. For several months after this I had the feeling that what I was looking for was on its way. I searched the internet for a specific but unknown image, I knew I would know it when i found it. But I found it is hard to find a photograph that had not been taken. of the photographs being taken, and a journal was started. this point nobody knew about the photographs except the UK based organisation. The second being the issue of telepathic or empathic communication, utilising mental imagery to convay in this case specifically a threat that was most unwelcome. This aspect was reinforced on the 15th October when a second incident occured, but this was the polar opposite to the previous encounter and left me feeling reassured and not as isolated, combined both these incidents served to bring the aspect of what appeared to happening into a stark reality. The months leading up to March 2014 gave me the opportunity to come to terms with what I appeared to be experiencing, my past was relived and the understanding of why I had lived my life the way that I had, all the spirtual encounters I had on both sides and every forgotten UFO sighting. Intense is an understatement and I frequently doubted my sanity. Then at the start of March 2014 decisions had been reached and took the next series of photographs that make up the remainder of The Introduction. Pages 7-17 appear to show two anomalous objects that appear to move up the images, with the larger anomaly moving back down. Pages 18-20 a single amomaly dissapearing into the cloud cover. Finally pages 21 and 22 a single large anomaly appearing between the roof and the 1st tree. Nothing was seen visually in any area. Then came the 8th March, abruptly woken with an overwhelming thought and sensation that I was late I immediately went to the window and started taking photographs. These photographs begin The Bigger Picture and appear to show movement of a large number of anomalous objects through the cloud cover around the area of the tv ariel primarily until page 8, where a single anomaly appears to move up to the right hand corner of the image. The following two images appear to show an attempt at interfering with the photographs being taken,the first being successful but the second only partially. This appears to show formations of much larger objects in the areas of the tv ariels, it must be mentioned that the apparent image dislocation is only in these areas, the roofs and chimneys are unaffected by any dislocation despited the lined distortion that is evident. This was the start of a very hectic day, with a variety of anomalies appearing at random and one anomaly appearing in the area for a large extent of the day. The pace at which this is all viewed is variable, the faster the pace the easier to see, once the location of the anomalies has been ascertained. To The Point is more single anomaly orientated with a different sized and shaped anomaly that appears on the left for most of this section. Then from page 195 appears to take a position between two forms that could easily be reflections on the window that viewed at a certain pace appear to interact with the smaller anomaly attempting to draw attention to this interaction. Finally The Finale, following the same impulse to take the photographs I felt compelled to change location from which the photographs were being taken, to focus on a view from the rear of the house and outside and not through a window. This resulted in a series of images that appear to show bird like forms that were not physically visible apparently leaving the area. Then on page 11 a white anomalous object appears next to the chimney on the right of the image. Then in the following images 4 more anomalous objects appear to leave the area before in the final image a single dark anomaly is evident and draws to a close this part of the Disclosure project and begins the preparation for The Red Book; Project Complete.